Certain restaurants in Miami offer young beautiful girls (who know the right people, of course) the opportunity to eat at their restaurant for free so that other people see these beautiful girls going and want to go too. It’s pretty brilliant marketing in my opinion, because half of the girls who show up are models that don’t eat a thing—they just sit there and look pretty, enjoying the free drinks, which costs the restaurant next to nothing (it doesn’t take much to get a girl weighing 100 pounds tipsy!). Anyways, I was invited to go one of these promotional dinners at Scarpetta by my girlfriend the other night, and unable to resist the temptation of free food, I did! I actually thought it was a pretty cool concept, but it would have been better if everyone at the table was in our group of friends. You see, they seat all of the girls at one long 20 person table, so you get to sit next to your friends but chances are pretty good that you’ll also be sitting next to someone you don’t know to your right or your left. Of course, this happened to me! I ended up sitting next to a beautiful girl from Australia that was most definitely a model, and she was joined by one of her other model friends (they were the organic and earthy looking type of models with their slicked back high buns and make-up free dewy faces…beautiful). I lit up like a Christmas tree as I took my seat next to them though because I assumed they wouldn’t be eating very much of the food, which is served family style to share with your neighbor. I was right…JACKPOT! The breadbasket was brought out first and no oneflinched. I couldn’t believe it! No one reacted to an assorted basket of warm freshly baked bread. All I could think was I am not a model, and I brought my appetite….this place may reconsider promotional dinners once they see the damage I’m about to do! I tried every type of bread that was in that basket, and the one with filled with salami and cheese (looks like a slice of stromboli) was my favorite. There was also a really tasty eggplant spread served alongside the butter that I enjoyed on the rosemary-scented focaccia. Next to be served were the appetizers. I started with a serving of the Burrata, which I thought would be pretty standard with Heirloom tomatoes, baby basil, and olive oil, but the burrata was the best I have ever tasted—it was so creamy and fresh that it was almost hard to keep on the fork. I was really amazed by how flavorful and delicious this simple dish tasted. Next I tried the Japanese Mackarel Tartar with balsamic vinager, avocado, and basil. I am not the biggest fan of tartar, but I thought it was tasty…I didn’t go for seconds though. The Raw Yellowtail with olio di zenzero, marinated onions, and baby greens was kind of the same thing for me, not into the raw fish but enjoy the single bite I had. 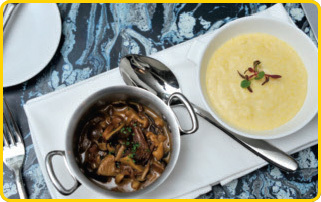 My favorite appetizer by far though, was the last to be brought out and it was the Creamy Polenta with fricassee of truffled mushrooms. WHOA! If someone told me that I had to eat one thing for the rest of my life, I would strongly consider this polenta as an option. Thankfully, the models wouldn’t even think about eating something as rich and fattening as polenta and so I practically got to enjoy the entire appetizer alone. Next to be served were the pasta dishes, which included Duck and Foie Gras Ravoli in Marsala Wine Reduction and Spaghetti Pomodoro. I do not like the idea of eating duck or duck liver, but I could not possibly deny myself these triangle purses of pasta served in a marsala wine reduction. 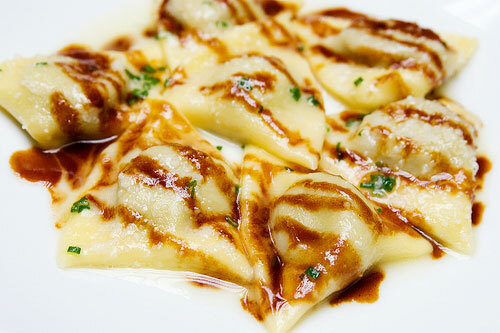 Each little ravioli was a bite of heaven, and tasted more delicious then I ever thought duck could. 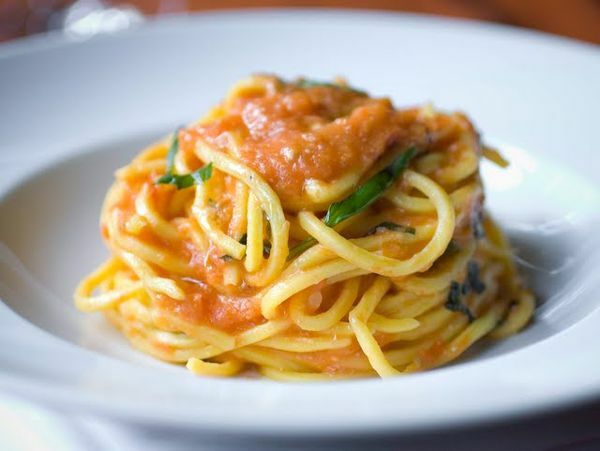 The Spaghetti, like the burrata, was delicious in its simplicity. The pasta was homemade and cooked perfectly Al Dente, topped with just the right amount of sauce. Finally, the dinner entrees were served which included Sliced Filet of Dteak with Roasted Fingerling Potatoes and Scallops served with Edamame. Neither of these entrée’s appear on the menu, leading me to believe that they were just specials for the evening, but they scallops were incredible. My absolute favorite part of the meal though (other than the polenta! ), had to be the desserts, which of course were left untouched by the models who instead decided to sip on herbal tea and watch me stuff my face!! I couldn’t tell if they were looking at me with jealousy as I poked my fork into every dessert, or with judgment but I couldn’t contain myself any longer and of course said to the model next to me, “You must have been saving yourself for these desserts all night, since you barely ate any dinner….want some?” She looked at me like I was crazy and told me that she was fine with her cup of chamomile. I genuinely felt bad for her. I’ll start by telling you about my favorite dessert, which was the homemade Chocolate Donuts filled with Nutella.They were warm and rich and just sinfully sweet. They came with a side of warm frosting to drizzle over top…I was actually moaning over them. Then I tasted the Guava Crème Brulee with homemade whipped cream, which was very good but not anything wow. The Mocha Cheesecake on the other hand was out of this world. I believe that it was a coffee infused cheesecake, but it was the chocolate and espresso bean crust that took it to a whole other level. Finally, the last desert that I sampled was the Chocolate Molten Cake with Vanilla Ice Cream. I am huge fan of molten cake to begin with, so I definitely savored every bite. I wouldn’t say that it was anything inspiring or creative, but they did it well. Overall, amazing meal…especially since a check never came at the end! Thanks for this great review! I am going to Miami in 2 weeks with my daughter and 2 of her friends (they are freshmen in college). 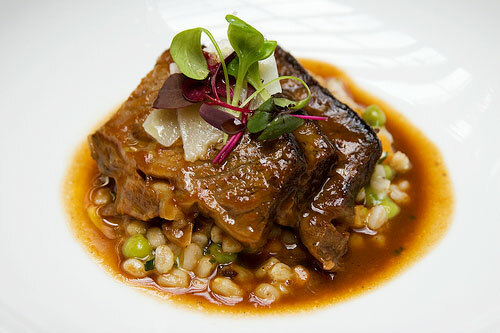 We will definately be checking out Scarpetta! I am excited for the buratta. 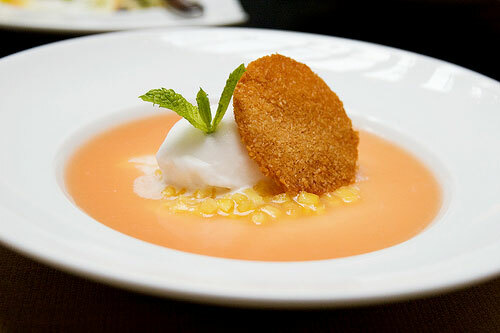 It is incredible but you must also try the Creamy Polenta, which is the most incredible thing there in my opinion. Have fun in Miami!